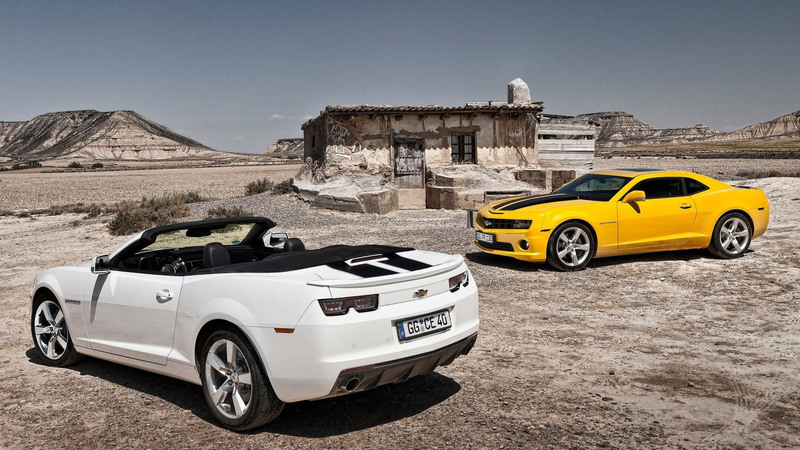 Two beautiful Chevrolet Camaro cars in a desert by an old building, in HD 1080p. Convertible with the white exterior & black interior. Coupe with the yellow exterior & black interior. Both cars with dark stripes on each car’s exterior. A base convertible model was priced at (MSRP) 65,700 USD ($) & for a coupe model at (MSRP) 57,000 USD ($). Current price of 2012 Chevrolet Camaro SS 6.2-liter V8 2 door convertible automatic in 2013 starts from around 61,000 USD ($) & for a coupe from around 50,000 USD ($). Either one of them looks great, but it depends on you, which car model you like the most. As you can see, the convertible model costs more than the coupe. Also, these prices are with all available options on these cars. Sure you can get a used 2012 Camaro SS for even a cheaper price than this, but it all depends on car’s condition & mileage. Also, plenty of these are available here for sale, so if you are looking to buy one of these, you might want to check out our classifieds on the homepage. Plenty of Camaros out there and not just SS models. All generation Camaro are available.